CAUTION: Drinking wine from this libbey glass may cause one to drink more wine! Ever ask yourself "I need a wine glass that fits my style?" This wine glass is the perfect choice after a long, rough day or a humorous start to enjoying a drink with friends. This wine glass quote will ring true with most avid vino fans and start a conversation of laughter and jokes. Whether you need a 21st birthday gift or 50th birthday gift, Christmas present, stocking stuffer, housewarming gift, hostess gift, wedding or anniversary gift (his and hers mr and mrs), girlfriend gift, gift for your parents (mom and dad), best friend, sister, daughter, novelty gag gift, retirement gift, or bachelorette / bridal shower gift, we've got you covered. LOL CONVERSATION STARTER! 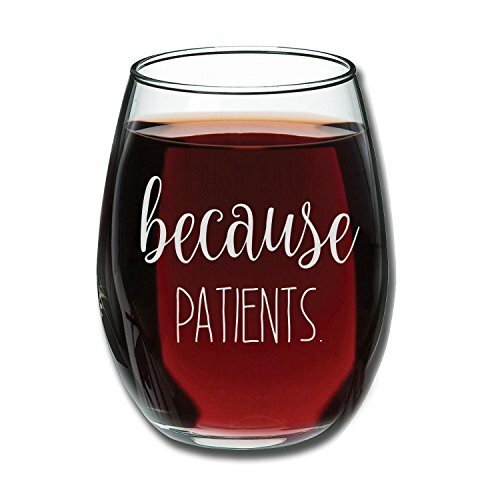 - Enjoy a relaxing evening with your new favorite stemless wine glass, which reads Because Patients. Holds 15 ounces of your favorite white or red vino. TOP QUALITY - Made in the USA with the highest quality materials that can guarantee its long life and their constant satisfaction. The wine glass that can ensure an enjoyable evening dinener for many years! CAREFULLY PACKAGED - Each Hilarious Wine Glass is carefully packaged in a durable gift box; guaranteed to arrive safely with free shipping through Amazon Prime.